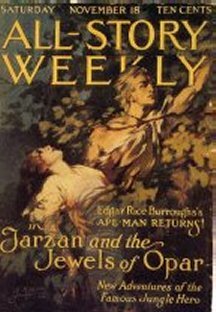 TARZAN AND THE JEWELS OF OPAR was released as a newspaper story-strip in 1930. 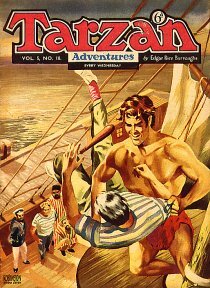 The Tarzan story-strips were not "comic strips", they were abridged versions of the novels with illustrations. 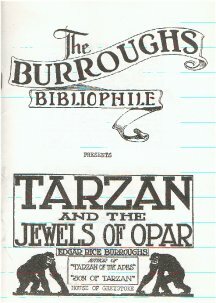 to start with the original strip, TARZAN OF THE APES, or with the strip which was in current release. 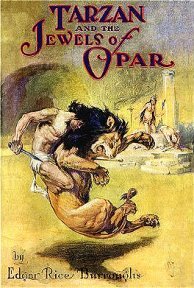 and TARZAN AND THE JEWELS OF OPAR was code "D" in the series. It ran for 102 daily episodes and contained 408 illustrations by Rex Maxon. This Whitman Better Little Book is a condensation of the novel with illustrations by Rex Maxon reprinted fromt he daily story-strip. The episodes concerning La of Opar are dropped from this version. 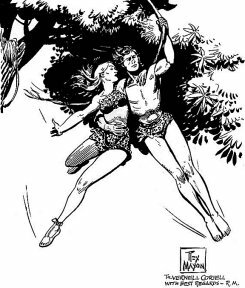 Tarzan Club Page introduces the man behind the Tarzan strip which you read in "Tarzan Adventures" each week: REX MAXON, whose brush first put the Jungle Lord into pictures on paper. REX MAXON was born in Lincoln, Nebraska, the home of the late artist, Clare Briggs, creator of WHEN A FEELER NEEDS A FRIEND. 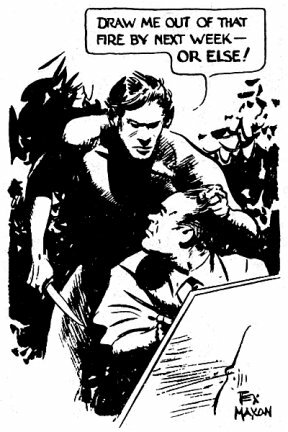 When Rex was still a boy, his brother, Paul, and the Briggs studied cartooning together. The Maxons moved to St. Louis and Rex was raised there and in suburban Webster Groves. 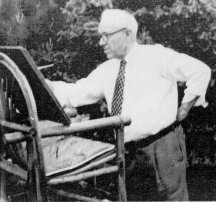 The Mississippi waterfront seemed to hold the youthful Maxon in a spell and he spent most of his time there sketching the old river steamers. However, the Maxons thought one artist in the family was enough and suggested that Rex became an electrical engineer. Rex refused to be discouraged and while still a lad of 17, in high school, he obtained a job with the Government during summer holidays painting the river steamboats. "My first newspaper job, in my late teens," says Mr. Maxon, "was on the St. Louis Republic, which has since closed down. After a short period in Chicago, where I studied art at the ARt Students' League, I did advertising art for an agency. Then I came to New York and did newspaper features, theatrical and semi-comic, for the Evening Mail and later the New York Globe." 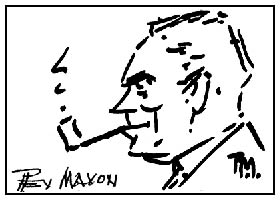 "From that work," Mr. Maxon continues, "I went to free-lancing, dividing my time between advertising and illustrating. 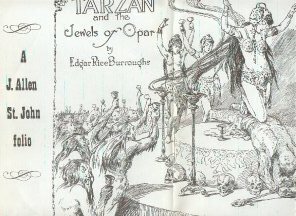 It was during this time while I was illustrating fiction for the Metropolitan News Syndicate, that I was chosen to do the Tarzan daily strip with fresh material when the story-strips finally caught up with the written works of Edgar Rice Burroughs. 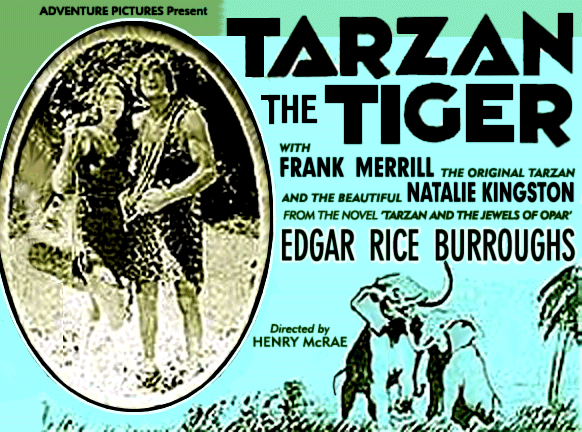 Mr. Maxon also introduced the first Sunday Tarzan page in colour on March 15th, 1931. However, the job of drawing both the daily and Sunday features took up so much of his time that he relinquished the Sunday colour page to other artists. Rex Maxon is now doing fine-art illustration work and painting as a free-lance artist. He lives with his wife, the former Hazel Carter, a newspaper feature writer, and their daughter Jeanne, about 45 miles from New York in Rockland County on the Hudson River.
. Daily Strips Sunday Pages I Sunday Pages II .